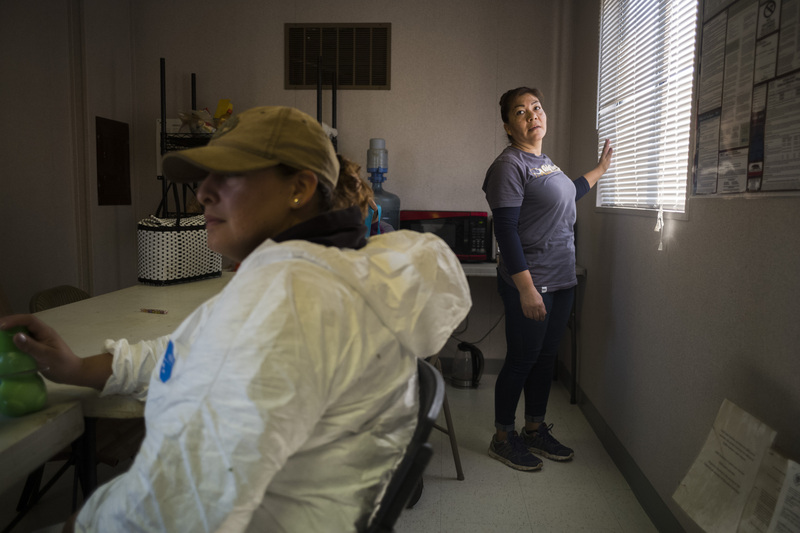 WATSONVILLE, California — For more than a decade, Emelia Martinez eked out a living as a seasonal farm laborer, which meant she earned about $11 an hour spending long, hot days stooping over to pick strawberries. Now the 46-year-old native of Mexico works in a climate-controlled greenhouse and makes nearly twice as much money at a year-round job. Martinez is still surrounded by berry fields at her new workplace, but she’s harvesting a different crop: marijuana, which became legal in California for recreational users on Jan. 1. On a recent morning, she took a break from watering a row of bushy, pungent weed plants to reflect on the benefits of her new gig. California farmers hire more than 800,000 workers every year, but the state is experiencing a long-term labor shortage, which in some cases has left crops rotting on the vine because there aren’t enough hands available for the harvest. And with demand for workers at an all-time high, there’s increasing concern that the marijuana industry, which has created around 43,000 new jobs since medical marijuana became legal in 1996 and is projected to grow to a $5 billion industry by 2019, will only exacerbate the situation. A local paper in Santa Cruz, Good Times, recently spoke with several berry farmers who complained about losing their best workers to pot growers. Officials from both the Farm Bureau and the Grower-Shipper Association of Central California told VICE News they had heard grumbling about it from their constituents. It’s unclear exactly how many agricultural workers have been poached by the marijuana industry — the best estimates are a few thousand at most. Harsh federal immigration policies and a variety of other economic factors are the bigger drivers of the labor shortage. 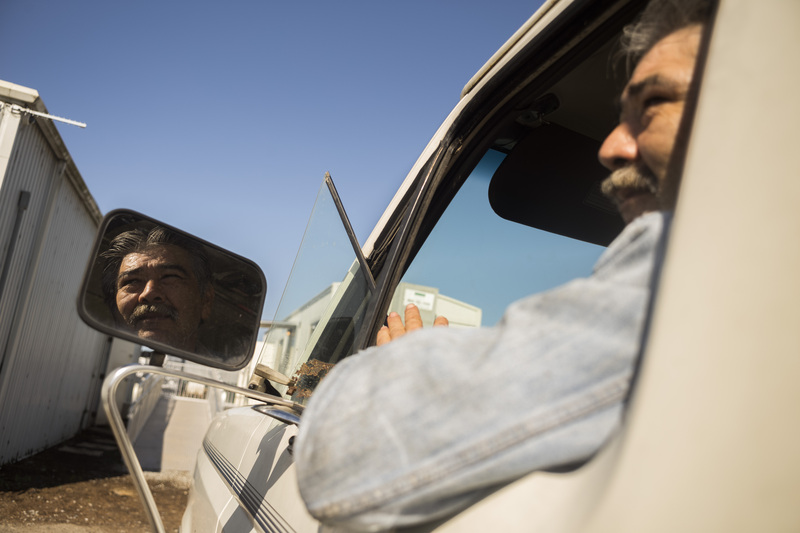 But rising tensions between traditional farmers and the state’s newest cash crop highlight the problems with the agriculture industry’s reliance on a mostly undocumented workforce. Until recently, farm labor was cheap and abundant, which meant workers could be treated as expendable. With marijuana growers now offering competitive pay and benefits, it could hasten the arrival of a moment of reckoning that has been years in the making. 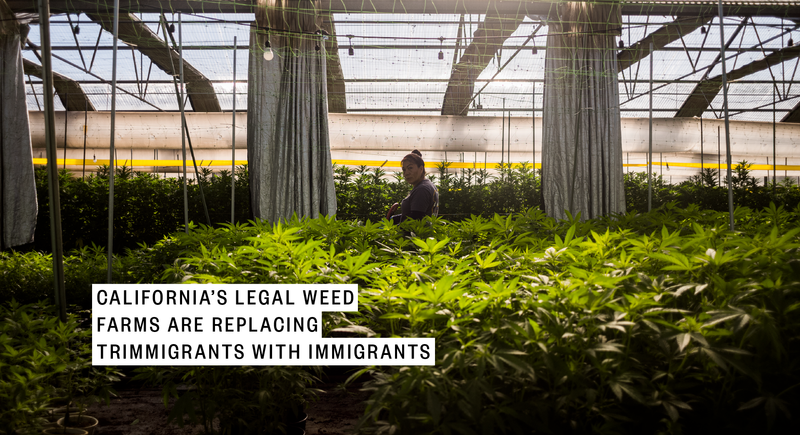 Traditionally, California marijuana growers have staffed their farms with friends, family members, and crews of “trimmigrant” hippies and wanderers. Martinez’s employer, Jon Friesell, the owner of Gold Coast Farms, says that model wouldn’t work for his business. 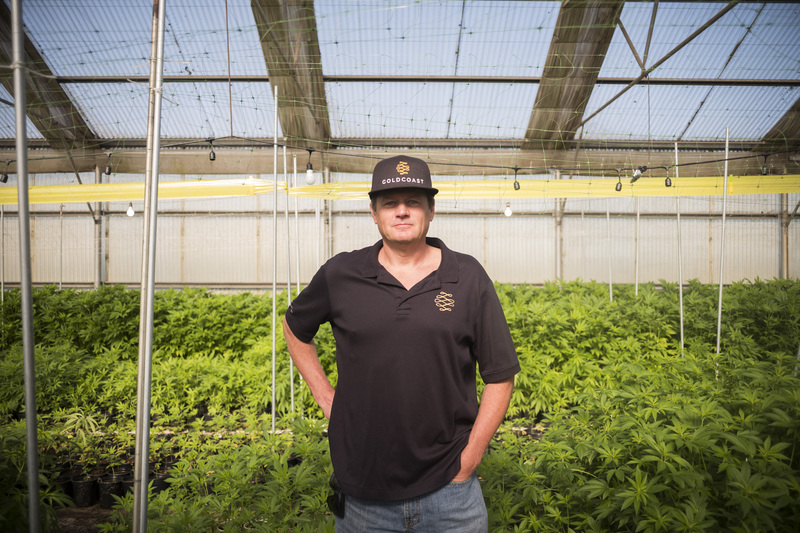 He has space for more than 25,000 mature plants that produce approximately 6,000 pounds per year, but between plummeting wholesale prices and steep taxes, his margins are thin. He employs 15 laborers, all of them Mexicans who used to work in the fruit or cut-flower industries. That’s relatively light staffing for an operation of his scale. Friesell understands perhaps better than anyone why traditional farmers would be anxious about the new source of competition in the labor market. His parents and grandparents grew flowers in Watsonville, and he worked in the family business until shortly after NAFTA took effect in 1994. The free trade agreement allowed Latin American countries to undercut the market, decimating the U.S. cut-flower industry almost overnight. Friesell found work as a firefighter but never lost his love for working with plants. When the state’s recreational law passed, he sensed an opportunity. The area had an abundance of greenhouse space left over from the flower-growing days, so he invested in converting a facility that once produced roses. He quickly found some advantages when it came to recruiting workers. His business isn’t seasonal, and while pot farming requires its share of tough manual labor, it’s still far less grueling than long, back-breaking days in the berry fields. Martinez said she never imagined working with marijuana, but now she has no interest in returning to the berry fields. Farm wages vary widely depending on the skill of the worker and the type of produce they’re harvesting, but pot isn't necessarily more lucrative. Friesell pays $18 to $22 an hour, which is roughly equivalent to what the average berry picker earns. But the industry standard is to offer “piece rate,” which means workers are paid based on how much they harvest on a given day. The most skilled pickers of berries, tomatoes, and other delicate types of produce can pocket $30-40 per hour. 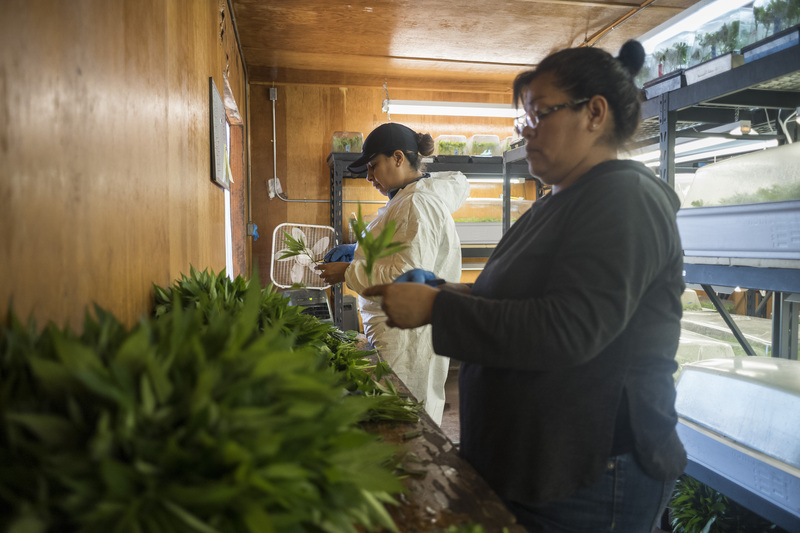 Friesell said all of his workers are on the formal payroll and either have legal status or work authorization, but working in the weed industry could carry risks for undocumented workers. Armando Elenes, a member of the executive board of the United Farm Workers, said his organization warns people who are in the country illegally that taking a job at a pot farm could prevent them from qualifying for a path to citizenship down the road. While weed growers can survive without undocumented workers, the traditional agriculture industry wouldn’t exist without them. It’s estimated that anywhere from half to three-quarters of farm laborers in California and elsewhere in the U.S. lack papers, and the ongoing labor shortage is partly the result of stepped-up immigration enforcement that began under President Obama and has escalated under the Trump administration. The threat of deportation isn’t the only thing keeping workers away from the fields. Some workers have left for better pay in construction and other industries. Others have simply aged out of the workforce, and their children — who are often U.S. citizens — have no interest in following in their footsteps. Mexico’s economy has also improved, and some workers have returned home to reunite with their families. As a result, more Mexicans are now leaving the country than coming to the U.S. Ultimately, however, immigration is the overarching issue in the labor shortage. Bryan Little, director of employment policy at the California Farm Bureau Federation, worries the current political climate around immigration could bring the labor crisis to a tipping point. In theory, the H-2A guest worker visa system should provide farmers with a cheap, legal seasonal workforce. But in practice, farmers say, the program, which allows more than 100,000 laborers to be temporarily imported from Mexico, Guatemala, and a host of other countries, is often more trouble than it’s worth. Jim Bogart, president of the Grower-Shipper Association of Central California, said it takes months for the paperwork to be processed, during which time conditions in the fields can change rapidly, leading to workers arriving too early or too late in the season. A proposed overhaul from Rep. Bob Goodlatte, a Republican from Virginia, would create a new classification for foreign agricultural workers and allow them to stay with employers for the entire year. It would also slash their hourly minimum wage from the current rate of $13.18 in California to $8.34, and do away with rules that require farmers to pay for housing and transportation. Goodlatte’s plan has drawn widespread criticism. The existing H-2A visa system has already come under fire for exposing workers to rampant exploitation, wage theft, and grim conditions, and the left-learning Economic Policy Institute argues Goodlatte’s bill is “a recipe for importing poverty and instituting a new era of legalized slavery in the United States.” Farmers also complain that it still doesn’t go far enough to meet their needs and wouldn’t be a viable option for their existing undocumented workforce. Because H-2A is a federal system and marijuana remains illegal under federal law, foreign labor remains off-limits for weed growers. Yet Allen said one of his biggest fears is that grow-op workers will eventually be treated as poorly as imported H-2A laborers. He joked about “huge, huge headaches” that come with offering employees perks like yoga breaks, but said it was usually worth it at the end of the day. Friesell said he tries to treat his workers right, including offering health benefits at a cost of $200 to $300 per month. A couple of employees from his family’s flower business have stuck with him for more than 20 years. He recently sponsored two workers for legal status. One of his new employees, Edmundo Silva, is a holdover from the rose-growing business. Sitting in the front seat of his white Ford Bronco, smoking a Marlboro on his morning break, the grizzled 60-year-old said he’s worked all sorts of agricultural jobs over the years, including picking berries. He said the word is trickling out about good jobs on the pot farm. Keegan Hamilton covers drug policy and immigration for VICE News.